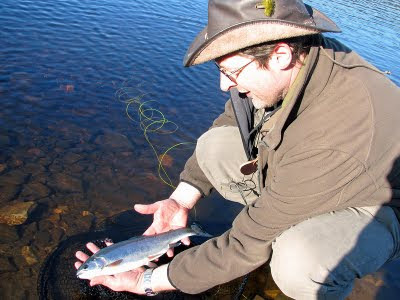 This post has been an awful long time coming, but finally - on a train on my way to a stag weekend in Liverpool - I've found time to patch together my account of a terrific day I had, doing something I do too little of these days; fly fishing. 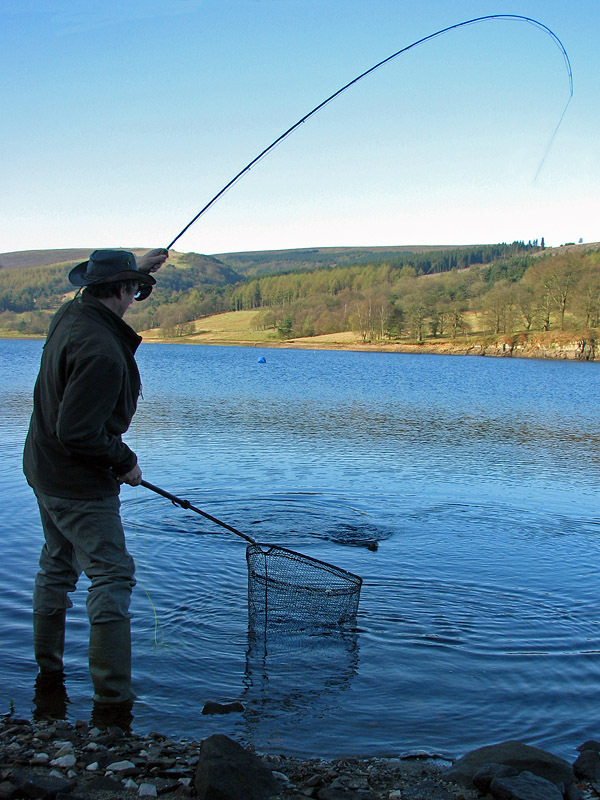 I received an email from Secretary of Errwood Fly Fishing Club, Ian Gould, offering the chance of "smashing your trout PB on fly gear", if I joined him in the Spring for a day on the club's venue, Errwood Reservoir. After taking a quick look on their website www.effc.co.uk/errwood.html at the quality of the scenery and the fishing on offer in the hills above Buxton in Derbyshire's Peak District, I could not resist a visit! Ian emailed me again towards the end of March, informing me that the season had kicked off well, with some very large fish coming out, so I got down there as soon as I could. 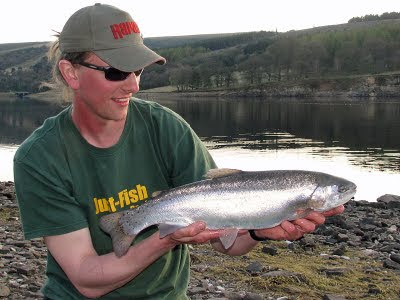 The week previous, Ian - who I believe still holds the venue record with a trout of over 14lb - had caught 3 double-figure trout the week prior to my visit. It turned out that I managed to pick the hottest, sunniest April day I can ever remember. I met up with Ian near Buxton so that I could follow him to the water; he pulled up with The Wildhearts blasting from his speakers and I knew we'd get on. We both remarked on the clear skies, which remained clear all day. It was to be unseasonably sunny and I don't think either of us could have predicted quite how hot it would be! So, we arrived at the venue; which I must say, having seen photos of the water on the internet, more than lived up to my expectations! Being an upland reservoir, surrounded by wildlife-rich moorland (we heard grouse and curlews calling throughout the day), Errwood evokes parallels to the Lake District or the Highlands of Scotland in both looks and atmosphere. It really is a beautiful place, but there was no time to contemplate the view when we arrived, because the sun was gradually creeping above the Eastern hills, illuminating the reservoir more by the minute. Our best chance to start off would definitely be in the corner close to the dam wall (known as "The Tower"), where the sun was yet to hit and the only slight ripples on the entire reservoir were there. As we walked from the cars we could see a few fish rising, so despite the weather, there were at least a few fish confident enough to feed. We set up our 6 weight fly rods with several feet of 6lb fluorocarbon as leader. I started off fishing Goldhead Montanas. I say Montanas plurally because for the first hour of the day I proceeded to decorate my immediate vicinity with several of Ian's finest. Various rocks, both in the water and on the bankside, now display flashes of colour thanks to my initial inept casting attempts, which thankfully improved before I had completely exhausted Ian's fly box! While I was having my problems, Ian was duly hooking fish, making the whole thing look way too easy; including landing a two-pounder first cast! Fearing that my casting predicament may last for a while, I made the most, photographically, of the fish Ian was landing. After this fish was returned (as all of the fish we caught were), both Ian and I missed takes and despite Ian's insistence that this was a slow day at Errwood, I couldn't believe quite how much action we were getting. We must have "pricked" a few of the missed takes and spooked the fish, because things quietened down once more, so we headed to the opposite corner of the reservoir to have lunch, regroup and hopefully find some more fish. This place is called "Duffer's Bank", so Ian had obviously realised my skill level by now! There was a slight breeze blowing towards us now, so there was a large accumulation of suspended matter which absolutely must have contained food; we just had to find a fish which longed for something a bit fluffier and sharper! 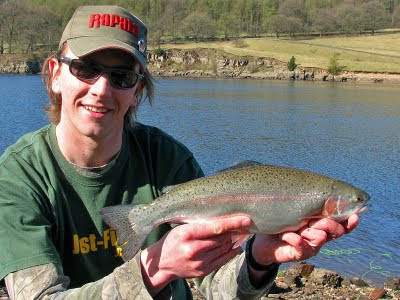 Ian did just this, and landed yet another rainbow. There were quite a few small fish rising here, which Ian affirmed were the wild brownies which abound in the water, but seldom see the bank. 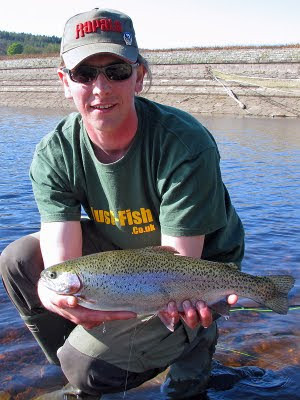 They tend to require finer tactics and smaller flies to tempt them, than the rainbows do. We moved down to the other corner on the West bank, known as "The Memorial" but nothing was moving there at all. We'd been out in the sun for a good few hours by now and were well beyond "sun-kissed". I had unwittingly become a redneck - in appearance rather than attitude - but I was having such a good day and I was determined that more and bigger fish would start showing once the sun was less intense. So, we decided to fish on and for the last couple of hours of the day we ended up back where we had started, near the dam tower. Finally my persistence began to pay off. I was fishing closest to the dam and as the sun began to sink the trout began to rise; nowhere more so than directly in front of me. I began trying to cast to rises, but they all seemed to be a few frustrating feet beyond my casting range. Finally I hooked into something which was no doubt larger than the fish I'd caught earlier. A lively and exciting fight ensued. I was further rewarded as the victor with a new PB trout of 3lb 3oz! I was completely won over by Errwood. It seems like the perfect fly fishing venue to me: Relatively easy to fish (but challenging if you want it to be - think wild browns! ), stocked with large, fit fish, set in the most impressive surroundings and of a size that can be comfortably explored in a day. 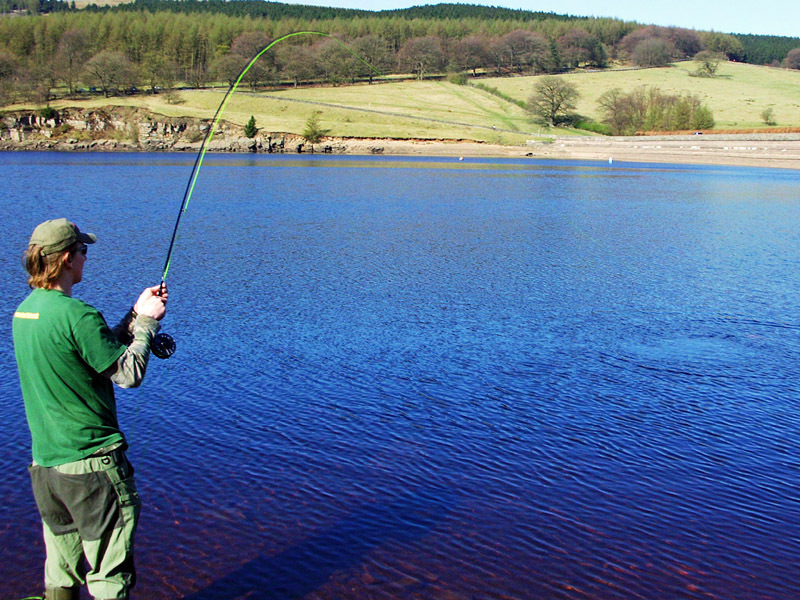 Seriously, what more could one ask of a trout venue? 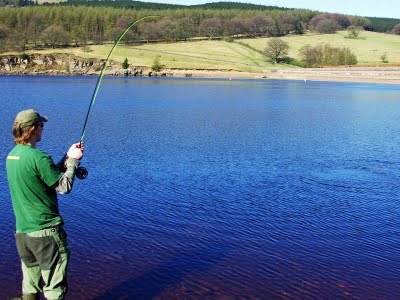 The river coarse fishing season is almost upon us, so I doubt I'll be heading back to Errwood any time soon, but a return trip next spring will give me something to really look forward to during next year's closed season. 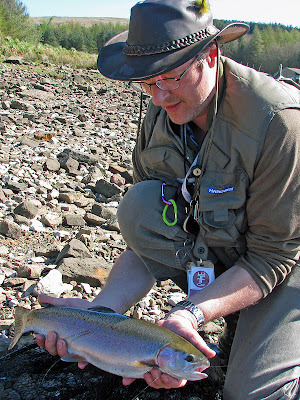 I would urge all coarse anglers or lapsed fly fishermen to make plans to do the same! If you're interested in sampling a bit of the action for yourself, there is plenty more information on the Errwood Website. You can fish on a day ticket, which needs to be purchased beforehand from one of many outlets, or you can become a member, for which there may be a waiting list. Keep an eye out for the July issue of Angling Star. There will be an all-new, more in-depth article about my day at Errwood, including some different photographs. As for my next few weeks, I should really be concentrating on my plans for the early season, but I'm in the throes of buying my first house, so this has been taking precedence over pretty much everything else! I'll be sneaking in a couple of sessions as and when I can, but nothing's set in stone. The blog shall be updated when I do go! A good review of a good day, however the Club record now stands at 15lb an overwintered fish caught by long time member Andy Jackson!